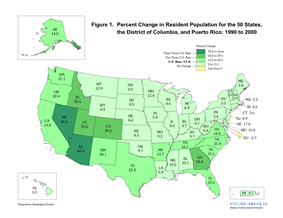 The Twenty-second United States Census, known as Census 2000 and conducted by the Census Bureau, determined the resident population of the United States on April 1, 2000, to be 281,421,906, an increase of 13.2% over the 248,709,873 persons enumerated during the 1990 Census. This was the twenty-second federal census and was at the time the largest civility administrative peacetime effort in the United States. 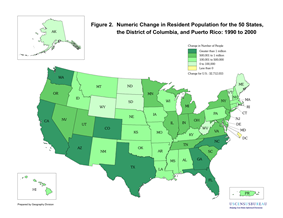 The U.S. resident population includes the total number of people in the 50 states and the District of Columbia. The Bureau also enumerated the residents of the associated state of Puerto Rico; its population was 3,808,610, an 8.1% increase over the number from a decade earlier. ^ "Population and Area (Historical Censuses)" (PDF). United States Census Bureau. Archived from the original on June 24, 2008. Retrieved June 20, 2008. ^ a b "Resident Population of the 50 States, and the District of Columbia April 1, 2000 (Census 2000) and April 1, 1990 (1990 Census)". ^ Jayson, Sharon. “’Colorblind’ Generation Doesn’t Blink at interracial Relationships.” USA TODAY. February 7, 2006: n.p. SIRS Researcher. Web. Oct 25, 2010. ^ Newburger, Eric (September 2001). "Home Computers and Internet Use in the United States: August 2000" (PDF). Current Population Reports (U.S. CENSUS BUREAU): 1–2. Retrieved December 5, 2014. ^ "Partisan Politics at Work:Sampling and the 2000 Census". American Political Science Association. ^ "Census 2000 Long Form Questionnaire" (PDF). Archived from the original on June 4, 2011. Retrieved April 25, 2011. ^ "Census 2000 Short Form Questionnaire" (PDF). Archived from the original on June 4, 2011. Retrieved April 25, 2011. ^ "US Census unmarried couple data listed by state". Gaydemographics.org. Retrieved April 25, 2011. Anderson, Margo; Fienberg, Stephen E. (1999). "To Sample or Not to Sample? The 2000 Census Controversy". The Journal of Interdisciplinary History 30 (1): 1–36. .